Thanks to serious time zone issues I was half asleep while I watched the French Open yesterday, and after the exit of all the big names in earlier rounds it was hardly a surprise that Roger Federer won. After all, he’s the second best clay court tennis player in the world. Unfortunately, that means I don’t have a lot to say. The match was, frankly, sort of routine. Soderling never really pushed Federer at all, and there weren’t many memorable moments — except for the last one, of course, when Federer hoisted #14 over his head. Still, I can hardly let this go by, can I? So here’s your chance to sound off. There are only two real questions left, I think. (1) Who’s the all-time best, Federer or Rod Laver? 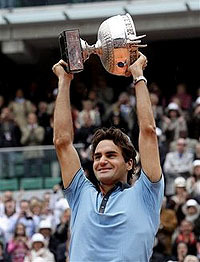 (2) How many slams will Federer win before his career is over? On the former, I think I might still take Laver by a nose. On the latter, I’ll take a guess at 19 — and at that point I’ll take Federer by a nose. Feel free to disagree on both scores in comments.